In 1953, twelve year old Jerry traveled from upstate New York to Little Rock, Arkansas to visit a sister about to have a baby. While there he witnessed ‘Colored ONLY’ signs at the city ZOO – restrooms and at the movie theater. Signs that told a white person where they could drink from a fountain and fountains for ‘Colored ONLY’. Jerry never got over the culture shock and the guilt that went along with it. He vowed one day to do something about it. 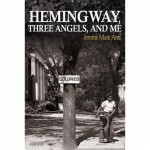 Antil’s book – Hemingway, Three Angels, and Me has been selling worldwide. The international – UK and Denmark Book Awards selected Hemingway’s book as the second best adult novel in Europe in 2017. The book tell the unique story of a boy who witnesses the prejudice of the Jim Crow era firsthand and then enlists his friends, family members, and neighbors to help Anna Kristina, one victim of that prejudice.